It’s easy to travel directly between Ukraine’s capital and the Black Sea city of Odessa. In a private car, the 474km distance can be covered in as little as 5 hours, assuming you’re not driving a Lada that is! Comfortable buses, companies such as Autolux, normally take about 6 hours to complete the journey and overnight trains are another option for getting between the two places. There are also regular flights between Kiev and Odessa but if you aren’t in a hurry and you want to see a bit more of this highly underrated country then you might want to consider breaking the journey in one or all of the following places; Uman, Vinnytsia (Vinnytsya) and Zhytomyr. When we visited these three places (summer of 2016), we travelled from Odessa to Kiev, firstly stopping in Uman, then Vinnytsia and finally Zhytomyr before reaching Kiev. We spent two nights each in Uman and Vinnytsia. This allowed us one full day in each city to look around, which was plenty. We spent one night in Zhytomyr. We arrived around lunchtime and spent the afternoon and best part of the following morning looking around before taking transport the short distance to Kiev. Again, this was enough time. Although there are trains that connect all of these places, the timings were either really antisocial or the journey took much longer so we took a bus for each journey except for the final one from Zhytomyr to Kiev, which we did in a marshrutka (fixed route minivan). If doing the journey in reverse, i.e. from Kiev to Odessa, it may be that train schedules aren’t as antisocial. Train times and schedules can be checked at uz.gov.ua/en. Getting from Odessa to Uman was straightforward. We used Autolux’s website to check out the timings of their buses and then turned up at their office about an hour before in order to buy the tickets. We opted for the 12:30pm departure, that got us into Uman at 4.30pm. It is the same bus that goes on to Kiev. You are supposed to be able to buy tickets online through Autolux’s website but we couldn’t make it work. Their office, which is located to the right of the railway station (if facing the main entrance) is quite a distance from the centre of Odessa (the area around Potemkin Steps) and we didn’t fancy wasting our time heading out there in order to buy our tickets in advance. We, therefore, took a gamble and just turned up. We managed to buy a couple of tickets for the departure we wanted but the bus was full by the time it left. There are several other bus companies in the same vicinity as Autolux and our backup plan was to try one of those if there were no tickets left. From memory, there was a regular, non-private bus departing from the main bus station at 1.30pm but it would have been slower and less comfortable. The Autolux bus remains the most comfortable bus we have ever travelled on in Ukraine with luxurious seats, free Wi-Fi and a smiley hostess serving free refreshment – it’s the simple things that sometimes impress the most when you travel long-term! For details of buses between Uman and Vinnytsia, we used the following useful website: ticket.bus.com.ua to look up the timings and double checked them with the staff at the bus station when we arrived in Uman. They tallied and we bought two tickets in advance of our intended departure date for the 9.20am bus, arriving in Vinnytsia at 12.25pm. For this journey, we were back to regular Ukrainian buses. The luxury of our one and only Autolux bus seemed but a distant memory but if you aren’t travelling between major cities in Ukraine, often or not all the buses are all similar – small, rattly and rather slow due to the number of regular stops that they make. On the plus side, they are very cheap and mostly adhere to a proper schedule. The closer you get to Kiev, the more frequent buses seem to become. There are at least hourly buses between Vinnytsia and Zhytomyr and the journey time is between 2 and 2.5 hours. Zhytomyr is only 140km west of Kiev and frequent buses and marshrutka speed along the tiny section of European Route E40 that links the two cities (*). 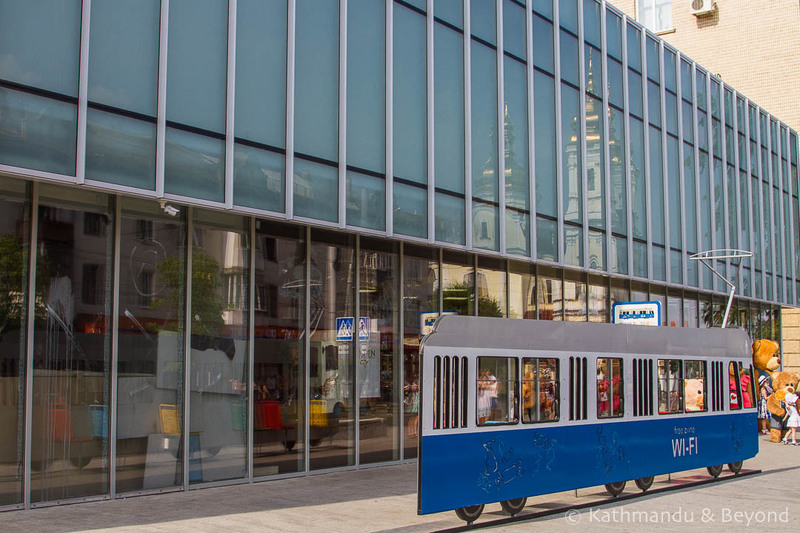 The journey time is approximately 1.5 hours and the marshrutka that we took from Zhytomyr’s bus station dropped us off at Zhytomyrska metro station in Kiev, which is on the red line and travels into the centre of the city. (*) I didn’t know this, but apparently, the E40 is the longest road route in Europe. It originates in Calais, France and terminates in eastern Kazakhstan at a place called Ridder. The route is over 8000km long and passes through France, Belgium, Germany, Poland, Ukraine and Russia before entering Central Asia at Kazakhstan. It then enters Uzbekistan, Turkmenistan and Kyrgyzstan before re-entering Kazakhstan for the second time. There you go; you learn a new thing every day! As an aside, it is debatable if you need to book bus tickets in advance in Ukraine for journeys such as the ones described above. Our bus from Uman to Vinnytsia for example, although small (at a guess 18-25 passenger capacity) was about half full by the time it departed but, equally, we have been on similar journeys elsewhere in Ukraine and been glad that we had purchased our tickets in advance as the buses had been full upon departure. We take the attitude that if we know when we are leaving a place, we buy tickets for our onward journey before leaving the bus station. Seat numbers are honoured on Ukrainian buses but depending on how chivalrous you are, you may end up giving yours away to an ageing babushka (granny). Uman is located almost bang in the middle between Kiev and Odessa. I would describe it as a large town rather than a city. The main drag is Yevropeiska Street, which leads to the town’s main square and city hall. 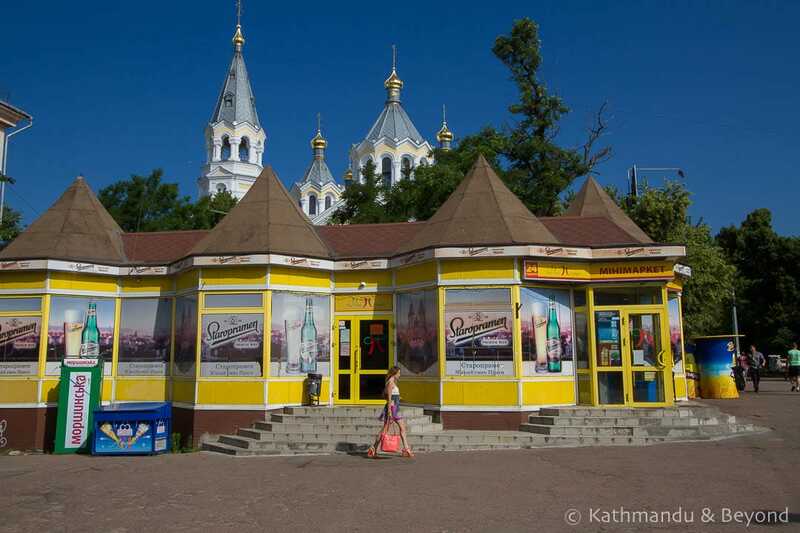 The bus station is about a 30-minute walk from the main square or a short marshrutka ride away. What is there to see and do in Uman? 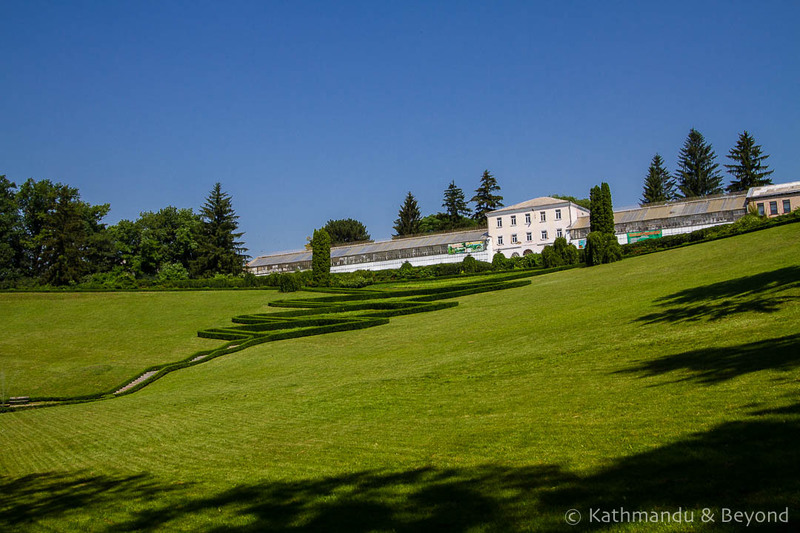 The main reason to stop in Uman (apart from to break the Kiev-Odessa journey) is to visit Sofiyivka Park. Reminiscent of an English country-home Capability Brown designed garden in places, the park was designed in the 19th Century and is home to over 2000 types of trees and brushes. 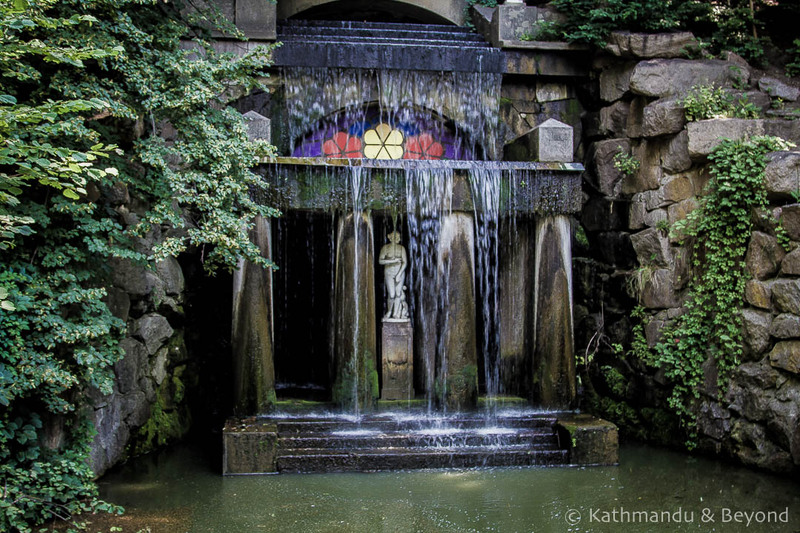 There are also rockeries, pavilions, water features, grottoes as well as plenty of places to get a bite to eat. The park is big so it is worth buying a map at the entrance which, although not in English, is self-explanatory and details several walking routes. It was a lovely sunny day when we visited plus it was also a Sunday so the park was busy with visiting Ukrainians (as was our hotel). We whiled away our time following some of the routes outlined on our map, people-watching and generally wandering around. 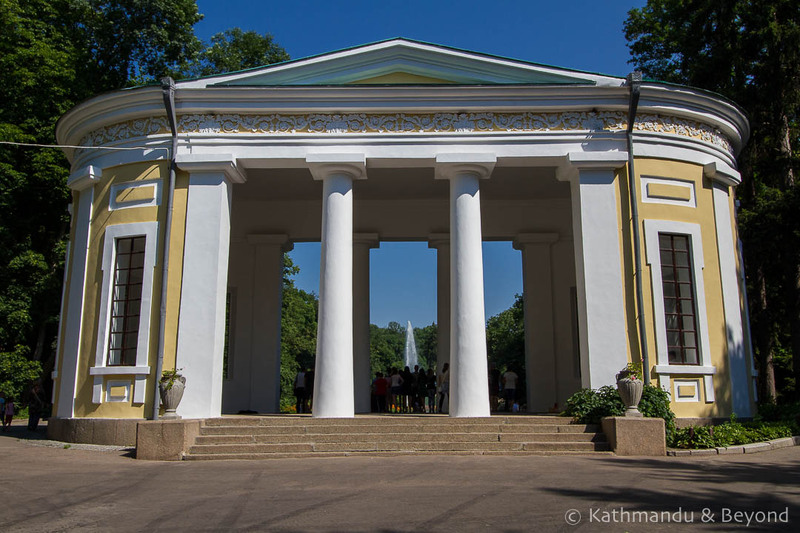 Lonely Planet suggests that the park is Ukraine’s answer to Versailles. I wouldn’t go that far (although I must admit I haven’t been to Versailles since I was very young) but it is certainly a very nice place and you don’t have to be into gardens and all things botanical in order to appreciate it. To get to the park from the centre of town, walk straight down Sadova Street for about 20 minutes and you will arrive at the park’s main entrance. 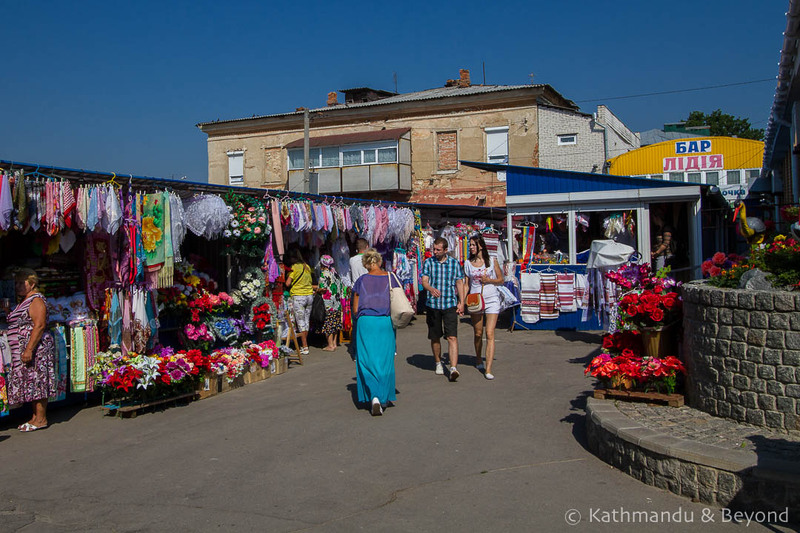 Away from Sofiyivka Park, if you do happen to be in Uman on a Sunday, the local market is fun for a bit plus the colourful Assumption Church is worth checking out. Uman, generally, is stuck in a bit of a time warp (circa 1985) and we spotted some classic, Soviet-era buildings and plenty of ageing Ladas and other Soviet Union-built cars, which, personally, pleased me no end. We stayed at the Fortetsya Hotel. The hotel was a little difficult to find (basically, head to the market and then walk down the pretty steep side path on the opposite side of the road) but once we found it, we were pleasantly surprised. The hotel was booked out with a wedding party and we thought we would be in for a noisy night but in the event, we had no issues. The room was a bit gaudy but everything worked fine and it was good value for money, especially as the room rate included breakfast. We paid roughly US$13.00 for the room per night, including a decent breakfast (*). (*) I’ve said before and I’ll say it again, Ukraine is like the budgie – cheap, cheap! All I can say is thank heavens for the Celentano pizzeria. 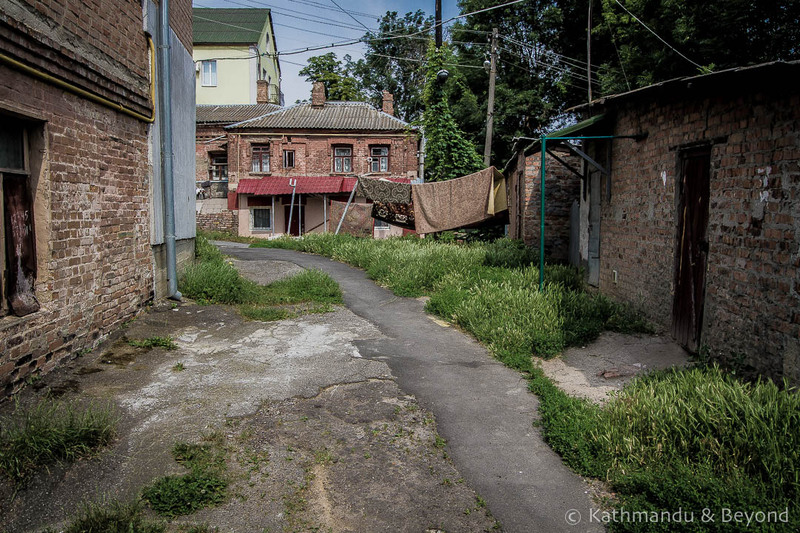 Although we were sick to the back teeth of pizza by this stage of our month-long trip through Ukraine, if this place hadn’t been around I don’t know where we would have eaten for two nights. Our hotel wasn’t doing dinner because they were catering for the large wedding party and we literally couldn’t find anywhere else to eat in the town. The pizza was good (ish) and the beer cold but the best thing of all was the lovely female manager who spoke great English and helped us order our meal every step of the way (*)! (*) I know it sounds a bit dramatic, but English is rarely spoken in Ukraine outside of Kiev and it is such a treat to find someone who not only speaks English but wants to practice it and have a bit of a chat. 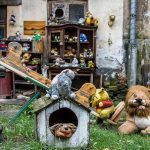 Vinnytsia, also known as Vinnytsya, was the highlight of our off-the-beaten-track journey through central Ukraine. It was by far the most interesting place we visited en route between Odessa and Kiev, plus it was also the most pleasant. Vinnytsya is also not an illogical place to break the journey between Kiev and Lviv. 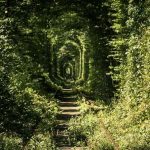 What is there to see and do in Vinnytsia? Vinnytsia’s epicentre is Independence Square and Kozitsky Park. Here you will find the red brick water tower complete with mock cascading waterfall (see photo) and the city’s War Memorial and eternal flame. The Water Tower apparently houses a War Veterans museum, but there was no sign of life every time every time we passed by so we gave up trying to visit it. To the south of Independence Square, on the opposite side of Soborna Street, is the striking, glass-dominated City Hall while northeast of the square, the backstreets are worth exploring for their urbanity and ramshackle buildings. Soborna Street is the main road in Vinnytsia. It runs from near the bus station, across the Southern Bug River and all the way up the hill past Independence Square and eventually terminates at Central City Park, the city’s largest green space. 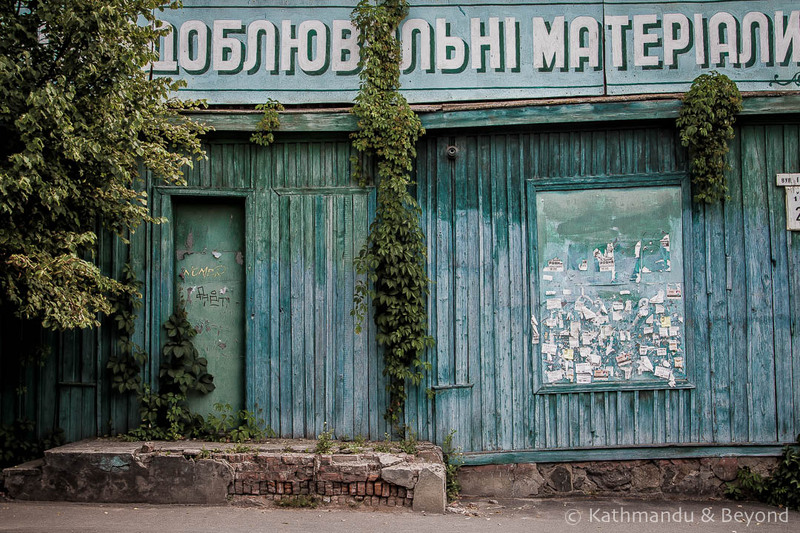 On or just off Soborna Street you will find Vinnytsia’s most interesting sights. 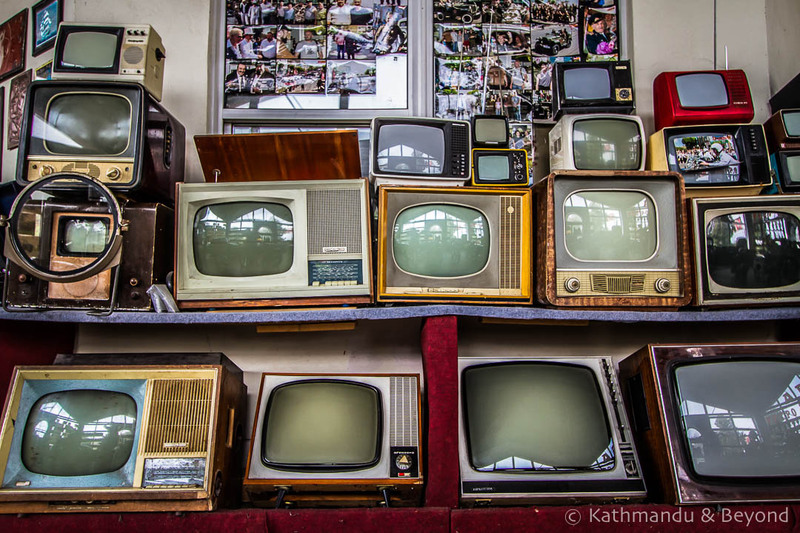 Our favourite was most certainly the catchily-named AutoMotoVeloPhotoTeleRadio Museum, a small but fascinating junkyard of a place packed with Soviet-era memorabilia. We also visited the Regional Museum, but having just come from the AutoMotoVeloPhotoTeleRadio Museum, we found it a bit formal and rather boring. 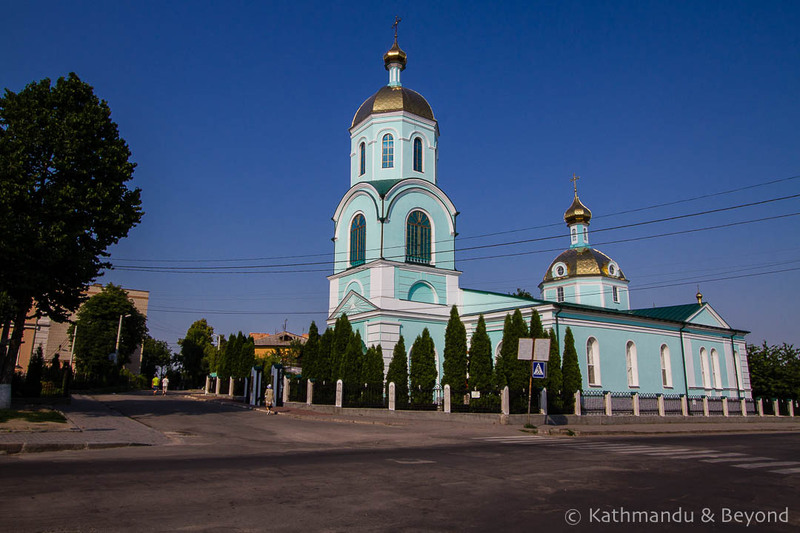 Two churches are also worth a look – the Transfiguration Church, which is also close to the bridge, more or less opposite the Soviet-era building just mentioned, and the eye-catching Greek Catholic Church, which is opposite the bus station. If you are a lover of all things Soviet, also check out the large chunk of concrete just down from the Transfiguration Church on the left-hand side if heading towards the bus station. It looks like it might have once been a sports hall but appeared to be abandoned when we poked around. 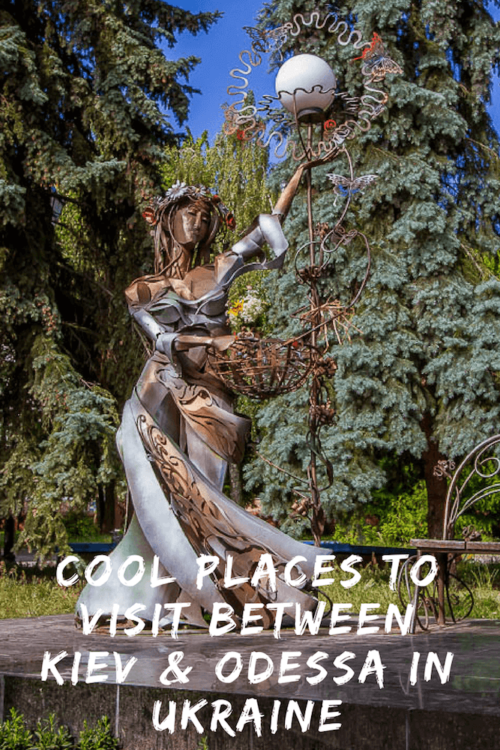 Any rundown on what to see and do in Vinnytsia wouldn’t be complete without the mention of chocolate. The Ukrainian confectionery company, Roshen, is based, among other places, in Vinnytsia. The company is controlled by the billionaire and current Ukrainian president, Petro Poroshenko. Lonely Planet describes him as a Willy Wonka-type character who, they say, was brought up in Vinnytsia but when I looked Petro Poroshenko up on google, there is no mention of him spending any time in the city or indeed being any kind of a recluse. 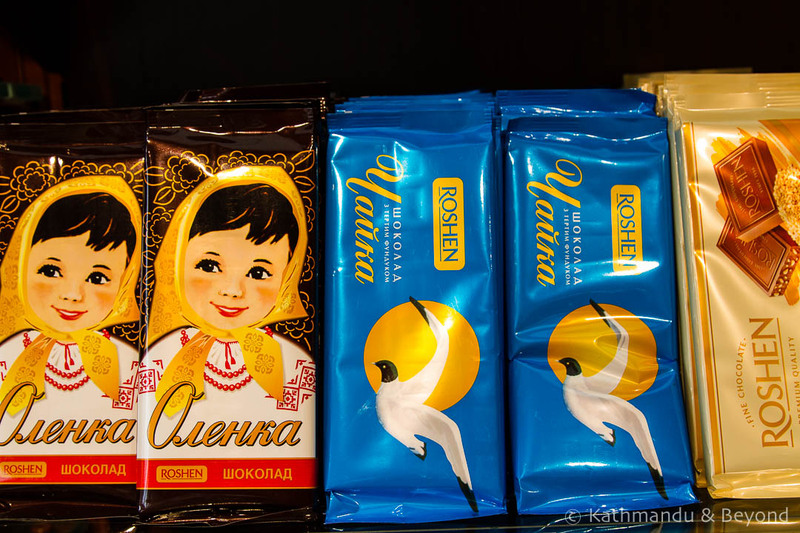 Regardless, Roshen Confectionery Corporation, to give the company its full name, is an important part of Vinnytsia’s economy and not only because the company’s huge factory (I assume) employs many of the city’s local population. Roshen is also indirectly responsible for attracting thousands of visitors (and therefore income) to the city on an annual basis. (*) Although there is a Roshen store on Soborna Street selling slabs of chocolate as well as other mouthwatering treats. Nope, it’s not the chocolate. 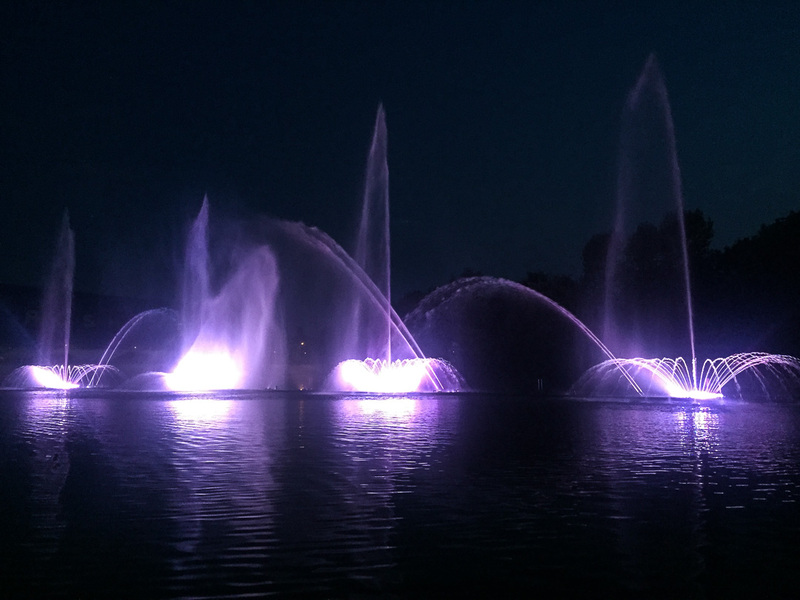 It is, in fact, the company’s incredible (and free) multimedia fountain, that puts on a spectacular display nightly throughout the summer months. Hailed as one of the most amazing fountains in the world, it is also the largest in Europe and evening performances, using lasers, 3D projection and superb acoustics, are held from early April to mid/late October. Depending on the time of year, the show doesn’t get going until 9pm or even later and lasts about 45 minutes. There is plenty of seating but it is still advisable to get there no later than 8.30pm in order to secure one. There is a funfair-type atmosphere on the bank of the river with vendors selling candy floss, those stupid whirly things that you throw up in the air and other such novelty toys and snacks. Expect lots of oohing and aahing from the excited crowd once the performance gets under way. One interesting fact about the fountain before I move on. According to Atlas Obscura (which is a great website by the way), ‘hibernation technology’ is used in the winter to protect the fountain from Ukraine’s harsh winter conditions. Around mid-October, the equipment is sunk to the bottom of the water, where it remains until the ice has thawed and it can be brought back to the surface once more. And one more thing. At this point, I need to make a little confession. Although I went down to the site of the fountain with Kirsty and stayed for about an hour, I didn’t actually see the performance. Kirsty did, so all of the information above is accurate, but England were playing Iceland in Euro 2016 and I considered it more important to find a bar and watch what turned out to be one of England’s worst ever performances in a football match rather than stay and marvel at one of the best sound and light shows in the world. To boot, I even managed to find the only bar in Vinnytsia with Icelanders in it – three of them. When do you ever encounter Icelandic travellers anywhere, let alone Ukraine – you couldn’t make it up! Edit from Kirsty: As you can see, the fountain wasn’t easy to capture in pictures. I did also attempt to take a video of the spectacular show, however it didn’t come out nearly as professional as this relatively short (2 minutes, 45 seconds) video I found on YouTube. Worth a look if you’re interested in seeing what the fuss is all about! We decided to treat ourselves in Vinnytsia and stayed at the Hotel France on Soborna Street. At US$26 per night (including a buffet breakfast), it was expensive by Ukrainian standards but we had a lovely room at this 4-star classified hotel, the staff were friendly and we even had a heated towel rack – handy for drying hand-washed laundry overnight! I can’t remember exactly the name of the place where we ate but it was near the water tower on Independence Square. There are several restaurants and cafes serving food around the square and this is the best place to head for a bite to eat. There are also a couple of bars on the square, one of which I frequented to watch the disastrous England – Iceland game. I have fond memories of Vinnytsia, apart from 90 minutes, which I would like to erase from my memory for evermore! Zhytomyr, which is only 140km west of Kiev, was the most Soviet of the three cities we visited between Odessa and the capital. Although smaller population-wise than Vinnytsia, Zhytomyr felt bigger and more spread out and we had to do a fair bit of walking to see the places of interest. 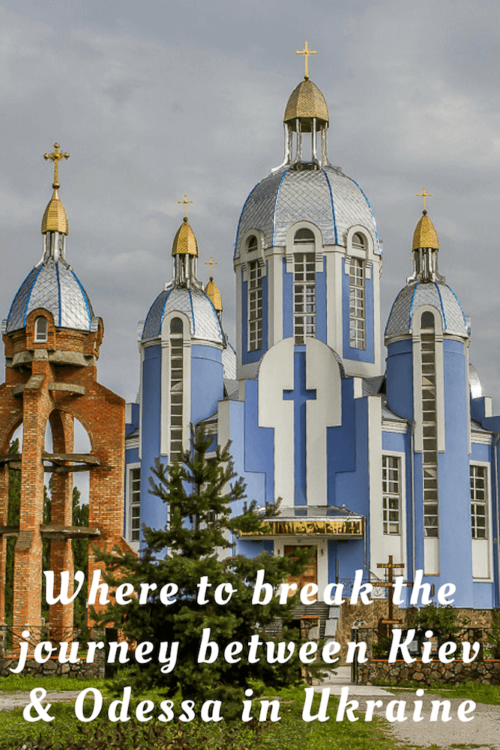 What is there to see and do in Zhytomyr? 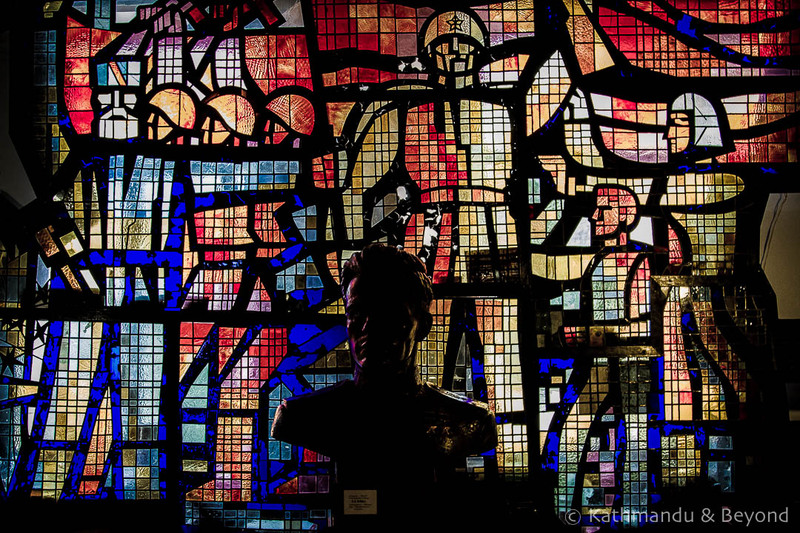 We were attracted to Zhytomyr by Lonely Planet’s mention of the Korolyov Cosmonaut Museum. We had never visited a cosmonaut museum before and the one in Zhytomyr had some pretty cool stuff inside it, including a lunar ranger, a couple of satellites and other space-related memorabilia (*). There is even a section within the museum dedicated to dogs that were sent into space as part of the Soviet space program. It’s very dark inside the museum and, as you walk around, you are accompanied by space-age music. Outside, a couple of large rockets and bust of Sergei Korolev, a prominent rocket engineer after whom the museum is named, are on display. The museum is about 20 minutes’ walk from the centre of the city (see map). 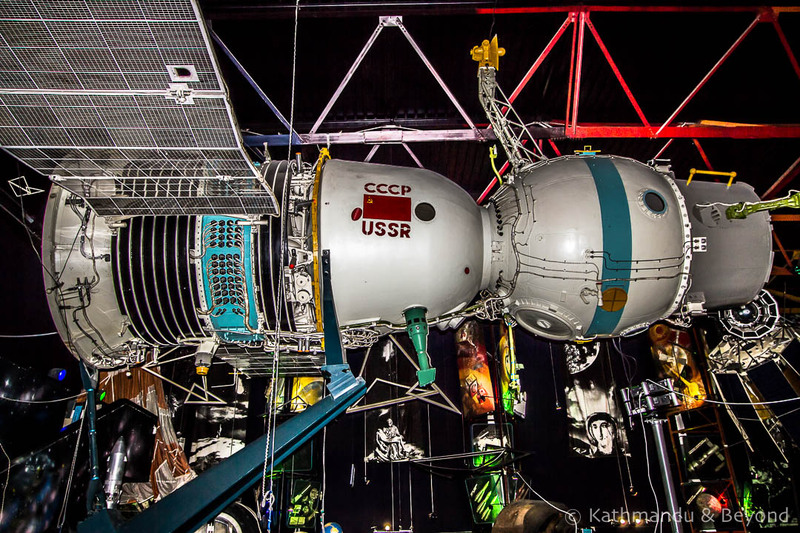 (*) Funnily enough, we ended up visiting another museum dedicated to the Soviet space program that week. The other one was part of the catchily-named Mid-Dnipro Museum of Folk Architecture & Life in Pereyaslav-Khmelnytsky, a small town 90km south-east of Kiev. Away from Korolyov Cosmonaut Museum, Zhytomyr’s other sights are clustered around either Maydan Soborny (main square), Victory Square or close to Mykhailivska street. I use the word sights loosely. Apart from the cosmonaut museum, Zhytomyr doesn’t have any must-see sights but it’s a pleasant enough city and certainly worth wandering around for a couple of hours or so. There are several churches in Zhytomyr, of which the most impressive is the Holy Transfiguration Cathedral, which is situated just behind Victory Square. It is also worth strolling down pedestrianised Mykhailivska street and if you are into Soviet-era architecture, check out the city’s court building (at the southern end of Mykhailivska street), the nearby orange-coloured theatre as well as the much larger Zhytomyr Ukrainian Music and Drama Theatre, which is located on Maydan Soborny. Also on Maydan Soborny you’ll find a large bedrock on which there used to be a gigantic statue of Lenin. In the past couple of years, the Ukrainian authorities have been pulling down statues of the communist revolutionary throughout ever corner of the country. It is part of a formal decommunisation process, which began in April 2015, after legal codes were passed outlawing, among other things, communist symbols and other such representation. 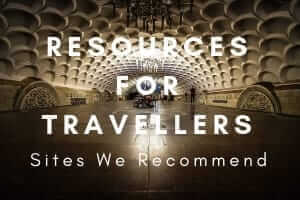 I mention it because the latest Lonely Planet Ukraine guidebook was published in April 2014 and in it, the authors sometimes make reference to a particular statue of Vladimir Lenin. On each occasion we’ve gone to check them out, we have found the same scenario – a large, stone base minus the statue of Comrade L. It is, therefore, best to ignore any reference to a Lenin statue in Lonely Planet. We stayed at the Hotel Ukraine (Ukrainia). 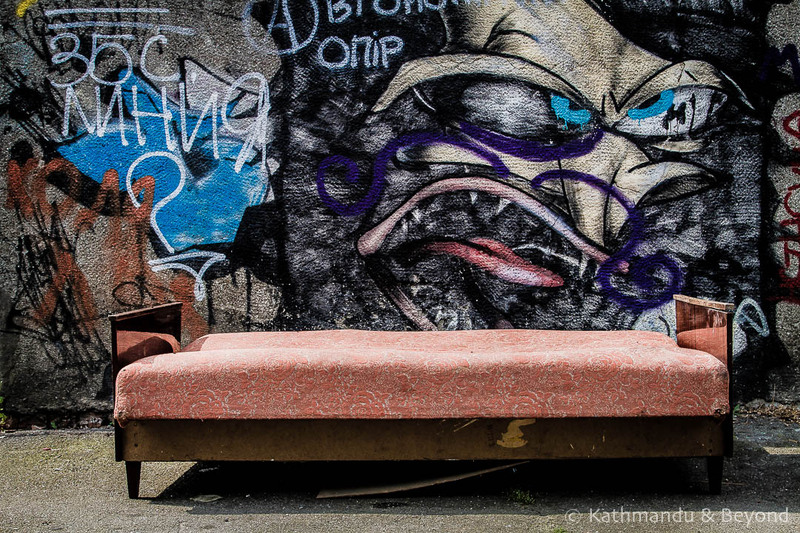 From the 1970s elevator and uniformed staff to the sofa-dominating bedrooms (you get a separate living area), the Hotel Ukraine harked back to the Soviet-era big time. The separate living area made the rooms very large and the location of the hotel, practically on Maydan Soborny, meant we were at the heart of the action, such as it is, in Zhytomyr. We paid $20 per night for a double room with breakfast included. I’ve waxed lyrical about canteen food in Ukraine before – point and pick, no waiting around, good value etc. – and the Chas Poyisty canteen in Zhytomyr is one of the best we have visited. Located opposite the mounted tank on Victory Square (and just round the corner from the Hotel Ukraine), Chas Poyisty has plenty of choices, several beers on draft and an outside rooftop dining area as well as an interior section. 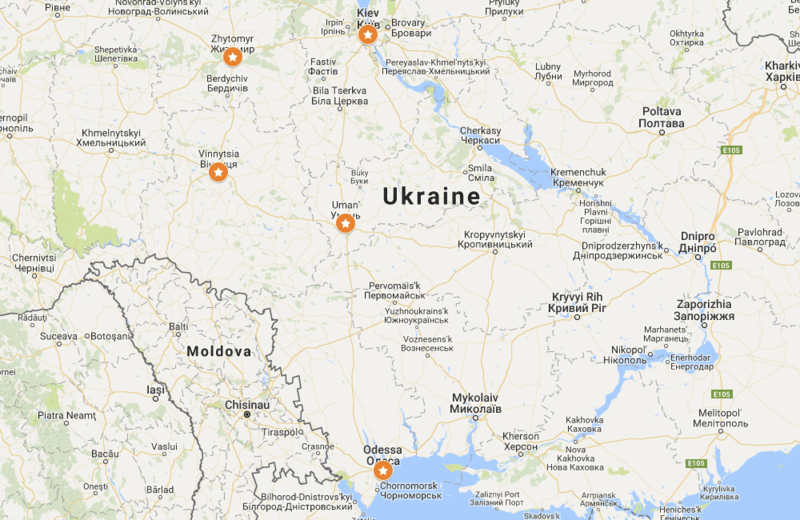 So that’s our roundup on where to stop between Kiev and Odessa (or vice versa). In summary, if you purely just want to break the journey then Uman is the logical place to do this. 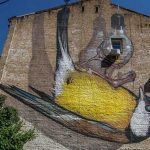 On the other hand, if you only want to visit one of the three places mentioned above then opt for Vinnytsia as it is the nicest city out of the three, plus it is the most interesting. 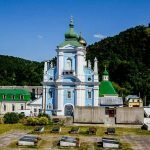 If you simply want to take an easy day trip out of Kiev then I would suggest Zhytomyr, although the Mid-Dnipro Museum of Folk Architecture & Life in Pereyaslav-Khmelnytsky is another good option and remember that it feasible to visit the Chernobyl Exclusion Zone on a full day excursion from Kiev as well. All of the above, except for the Chernobyl Exclusion Zone (which sees a lot of visitors these days) are off-the-beaten-track and worth visiting if you have plenty of time in Ukraine and want to see beyond Kiev, Odessa and Lviv. Thank you! Ukraine is an interesting country with lots to offer! Wow, some large distances in the Ukraine. I’ve mentioned that we’d like to go to Lviv…I also thought maybe Kiev. But the distances are great and we also want to spend time in Poland and Moravia. Might be stretching ourselves too much including Kiev. Indeed, Ukraine is the second largest country in Europe after Russia! Getting between Lviv and Kiev is pretty straight forward though, the train is very comfortable and takes six hours. Vinnytsia looks like the winner of the three for me, but that theater in Zhytomyr looks awesome, too! Can’t wait to spend more time in Ukraine. Our two weeks there just whet our appetite for the place. You guys need to head to Kharkiv if you haven’t been already! This is great. We were planning to stop at Vinnytsia on the way to West Ukraine next year, and that fountain display seems worth it in itself. Thanks and of the three places, Vinnytsia had the most going for it. I do feel bad about missing the fountain display in order to watch a football match but what can you do! Also, given it’s easy to reach from Kiev, you might want to consider Zhytomyr for an overnight or even a weekend. We’ve been twice now and the place definitely grows on you. Thanks for these tips! I’m heading to Ukraine in late July and early August and have been dreading the long hauls on public transportation, so I’m going to follow your suggested route on the way from Odessa to Kiev – I’ll do two nights in Uman and one each in Zhytomyr and Vinnytsia! Thanks Carly, very happy to hear you found the post helpful. The bus timings from Odessa and on to Vinnytsia don’t help but, to be honest, half a day in Uman is enough. 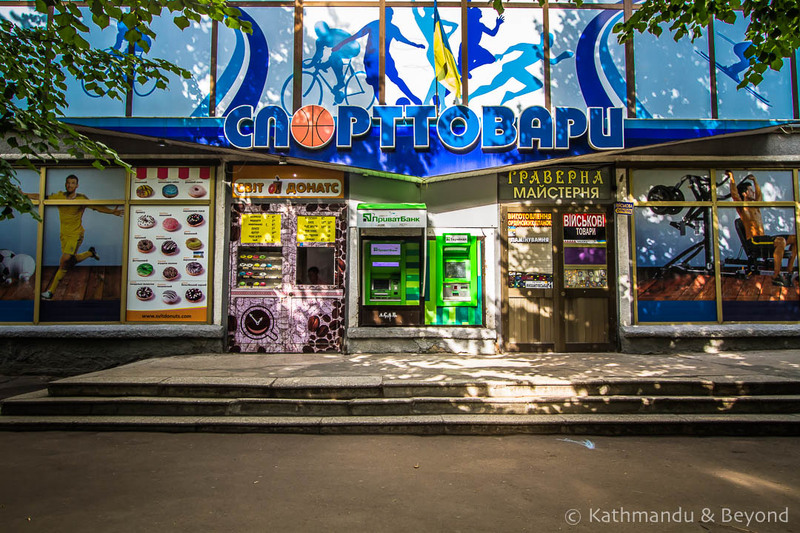 If you are able to squeeze in more time anywhere, Vinnytsia is our recommendation. One night in Zhytomyr is probably sufficient as regular transport to Kiev means you can spent most of the following day there if you need to. Enjoy Ukraine. Kiev is one of my favourite cities in the world! Just wanted to let you know that I’m following in your footsteps – literally! Just checked out if Fortestya this morning and into Hotel France an hour ago… and hanging my wet laundry up to dry right now! That’s great to hear! Perhaps we should write a post featuring the best hotels for doing laundry in the sink! Lol! Where next after Vinnytsia? Thank you very much for this article! Very usefull. Great, we are happy you found this post useful!